Technology has changed Georgia’s multi-billion-dollar manufacturing industry dramatically. For workers with the right skills, job opportunities have never been better. Jason Moss says the very word “manufacturing” makes a lot of people think of Lucy and Ethel in the candy factory, the classic I Love Lucy scene. “They think of it as a production-line-only job. That’s far from the truth,” says Moss, who is founder and CEO of the Georgia Manufacturing Alliance. Funny as that scene is, the old black-and-white image of TV comics stuffing chocolates in their mouths to keep up with a fast-moving conveyor belt doesn’t begin to reflect the reality of advanced manufacturing in Georgia and the sophisticated technology it uses. Truth is, unskilled work and workers are rapidly disappearing. “Technical advances are helping companies automate processes to be more efficient and to utilize less human capital and to be more exact in their processes,” says Tom Croteau, deputy commissioner for global commerce at the Georgia Department of Economic Development (GDEcD). These changes, which have occurred over the last few years – spurred by the recession and the loss of factories to places where labor is cheaper – are helping revive the manufacturing industry even as they are creating a huge demand for the skilled labor needed to make the advanced processes work. Today Georgia has more than 10,000 manufacturing facilities employing upwards of 360,000 workers; the industry makes up more than 11 percent of the state’s economy. The figures include traditional – there is still some of that around – and advanced manufacturing. Total manufacturing output for 2015 was $54.8 billion, and manufactured goods accounted for 91 percent of Georgia’s total exports in 2016. “I don’t believe there are many operations that are left today that are not employing automation and technology,” says Croteau. “We’ve become such a global economy that you just can’t survive if you are not efficient with your processes. “An infusion of technology and the idea of advanced manufacturing are really offering the opportunity to bring all kinds of manufacturing back to Georgia, from apparel to flooring to wood industries,” he says. A new 74,000-square-foot adidas SPEED FACTORY, which will use robots to manufacture running shoes, is set to open in Cherokee County before the end of the year. Advanced techniques are in play across the manufacturing spectrum; the automotive industry is usually the one that comes to mind first. The Kia plant in West Point, which relies heavily on robotics, has the capacity to produce 360,000 cars every year. So exactly what turned manufacturing into advanced manufacturing? West Georgia Technical College’s Steve Cromer, senior director of advanced manufacturing, credits consumer demand for high-quality goods at lower costs for boosting advanced manufacturing. Advanced manufacturing techniques have been a real boon for flooring, which endured some tough times. “Our industry certainly was faced with some challenges,” says Shaw’s Cooksey. “Not only was the industry hit by the recession and decreases in housing, but at the same time was facing some shifts in consumer preferences. It used to be carpet was the main type of flooring that was in demand, then [it] shifted to more hard-surface products. A lot of things were happening at the same time. When Standard Textile made the decision four years ago to bring its manufacturing operations back to the U.S., all the efforts started at its plant in Thomaston, says Gary Heiman, president and CEO. The plant opened in April 2015 and employs about 200 people to make bed and bath products, including all towels used by the Marriott hotel chain in North America. The company is headquartered in Cincinnati. “The major inhibiting factor in the U.S. is the cost of labor,” Heiman says, “with all that includes – healthcare, and so on and so forth. By design, this eliminated a lot of manual labor. “You don’t have to have tens and tens of people dealing with quality control and quality assurance and many, many other factors where you’re using the human eye,” he says. The same factors that made Georgia a good place for traditional manufacturing work for advanced manufacturing operations: favorable business climate, business-savvy state leadership, great location and a logistical system that makes it easy to import raw materials and export finished goods. For international companies, he says, the diversity in and around the city of Atlanta adds an extra level of comfort. All good, of course. But the reality is there is a real shortage of skilled workers to fill the new jobs that are opening up. Lots of folks are working to help fill that demand, especially Georgia’s technical college system, the economic development department, the manufacturing industry itself and individual companies. Gains in manufacturing efficiencies have made training and re-training even more crucial for companies that need employees to work with the new processes and for workers who can no longer get by without skills. 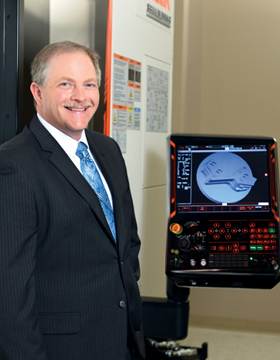 In the new world of advanced manufacturing, non-skilled positions are rapidly disappearing, says Steve Cromer, senior director of advanced manufacturing at West Georgia Technical College. “Go on a factory floor today,” he says, “and there may be 500 employees. Go back in five years, and they’ll be doing more operations at a faster pace and higher quality and maybe have 150 or 200 less positions,” because non-skilled jobs will be automated. West Georgia’s training focus is precision manufacturing, which supports manufacturers in the region, including but not limited to automotive. “Anything in the production facility that moves product from one point to another in automated fashion without a human interaction is what we’re training the students to work on,” he says. The college has three different locations – LaGrange, Coweta and Carrollton – where the classes are taught. The placement record for students who graduate, he says, is 100 percent. More than 1,800 students are enrolled each year in those programs; nine within the system have a special advanced manufacturing focus, like West Georgia’s. Georgia Piedmont Technical College is set to open a new advanced manufacturing lab in November at its Newton campus. The technical college system operates Georgia’s top-rated Quick Start program, which helps new or expanding operations train their workers to companies’ specific needs. And Hornsby says the system is putting a great deal of effort into apprenticeship programs and working with students in the Move On When Ready program, which allows them to earn college credits while they are still in high school.